Practice is an essential part of learning any instrument/discipline. Parents can help their children practice by setting aside a particular time each day, especially for practice. Children like a routine, so after a while, will practice automatically at that time each day. A little practice often is far better that one long session. Enrolment requires a completed enrolment form and full payment of tuition fees. Students must enrol for a minimum of one full term. Students are scheduled on a first come first served basis. We make every effort to suit student preferences. However, scheduling of lessons will depend on available time slots. The school may also cancel a course if there are insufficient enrolment numbers. The school reserves the right of admission. Students are automatically re-enrolled in subsequent terms within a school year. If you do not wish to continue classes in the following term, you must advise the school office at least 2 weeks prior to the end of the current term to avoid being billed for the following term. Students paying term by term must ensure payment for next term is made by the end of the current term in order to guarantee their place in the following term. Killarney School of Music prepares students for both Traditional and Classical exams. Taking exams is entirely optional, whether to have formal recognition of achievement or provide an incentive to practice. The teacher has the final say on whether or not the student is ready to be put forward for an exam. The school uses text or email messaging to notify parents/students of events relevant to the school. Please keep school office up to date on the best and most current mobile phone number and email address to send messages to. If a student is not feeling well, we ask that they are not brought in for lessons as the illness may spread to other students and teacher causing absence and others missing out on their lessons. As a general rule of thumb, if a student was not well enough to attend school/work that day, they should not be attending music lessons. Payment must be made for all lessons, whether taken or missed. Replacement lessons will not be offered in the case of student absence. As a courtesy to the teacher, we ask that the school office be notified if a student is to be absent. No refund is given if the student decides to discontinue with lessons. If a teacher is unable to give a lesson, a substitute teacher may give the lesson, or else a replacement class will be offered for a later date. While we endeavor to run replacement classes on the same weekday/time of the class being replaced (usually the week after term-end), this is not always possible. In this case, the replacement lessons may be run on a different day and/or time of the week. Due to the volume of students in a teachers’ schedules, it is only possible for teachers to offer one replacement option. If a student does not attend the offered replacement lesson, refunds cannot be given. 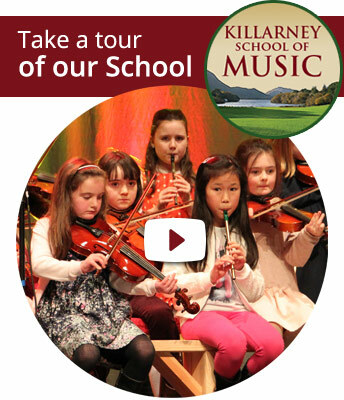 It is the policy of the Killarney School of Music that parents do not accompany their child in the classroom unless specifically requested by the teacher. Sometimes, young children need the reassurance of their parents in the classroom for the first couple of weeks. Otherwise, the presence of a parent in the classroom can be counter-productive as it interferes with the natural student-teacher relationship. Lessons are scheduled back to back with no time to spare in-between classes. Therefore we ask that parents do not delay the teacher when your child’s class time has finished. If you wish to speak to the teacher you may do so during your child’s class time or arrange to meet with the teacher at a different time, another option is ask the teacher to phone you at a time that is suitable to both. We appreciate your co-operation in this matter. From time to time we take photographs/videos of students performing during lessons, workshops or concerts for possible use on our website, Facebook page or publications. No compensation is provided to individuals who appear in the photographs/videos. Please let us know if you do not wish you or your child’s photograph/video to appear on our website, Facebook page or publications. To ensure your child’s safety, please be sure to pick him/her up promptly after lesson/class time. Children are under supervision during their instruction time only. The school is not responsible for supervising children outside of teaching time. We normally run parent-teacher meetings on the week following end of Term 1. Parents will be notified of details by text/email closer to the time. Killarney School of Music reserves the right to dismiss any student for disciplinary reasons such as disruptive behavior, as this interferes with other students. Students thus dismissed are not entitled to any refund of tuition fees.